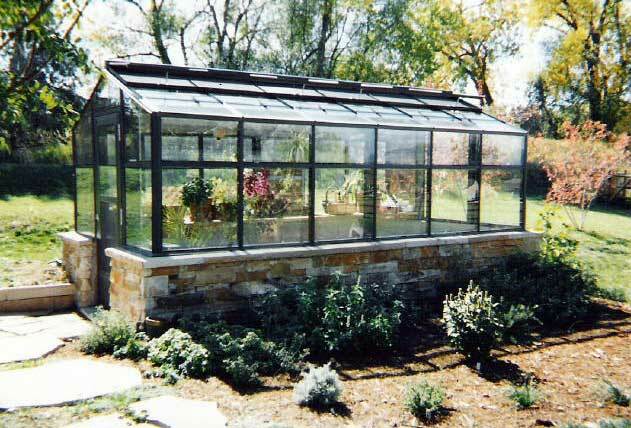 Grand Hideaway Greenhouses are all that you have dreamed of in a professional quality greenhouses. You can select a free-standing unit or attach it to your home. 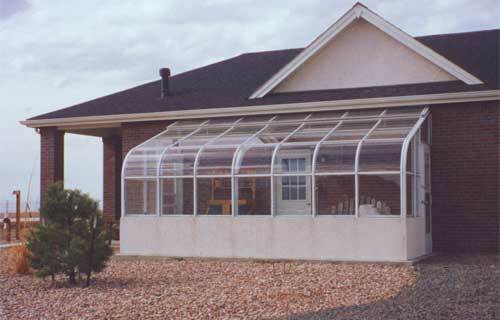 Grand Hideaway Greenhouses come with traditional even-span gables or popular lean-to styles with straight or curved eaves. 1/8" tempered is standard glazing. 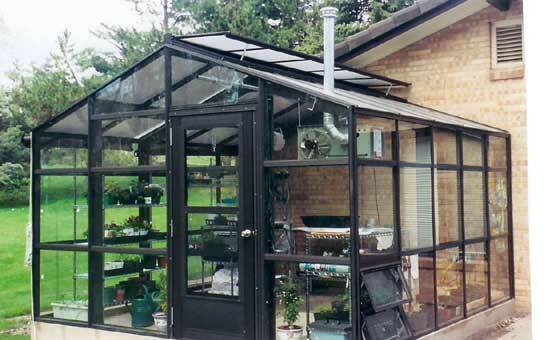 Grand Hideaway Greenhouses give you the highest value for your investment. $ 60+ per square foot***. Frame - Standard extruded aluminum frame for strength and durability. Bronze or white baked-on enamel frame. All framing and glazing members are pre-drilled, and pre-cut. 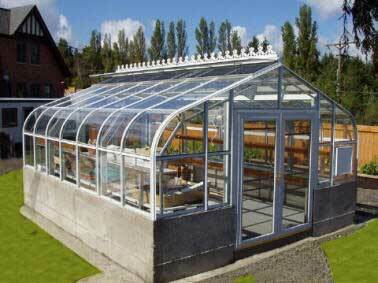 Glazing - Standard 1/8" clear tempered glass OR 8mm TRIPLE-WALL polycarbonate (available for straight eave only). Glazing Components - Extruded butyl rope is used to keep glass secure. Butyl rope is used to keep glass secure. Butyl rope has outstanding sealing properties, and is more resilient and less affected by age and weathering than other types of bedding. Ventilation - STANDARD continuous row of thermostatically controlled roof vents with screens. Vent assemblies are equipped with extruded E.P.D.M. weather stripping to create an air/water seal. Model Choices - Many standard lengths and widths available. Door - All models available with aluminum storm door(s). 1-5/8" heavy duty frame. Elegant brass handle. Keyed deadbolt for security. Foundation - Foundation or footer required. In cold climates a foundation below frost line is recommended. Standard kneewall height is 28" for kneewall models. Engineering - Designed and engineered to meet loading requirements as required by building codes. 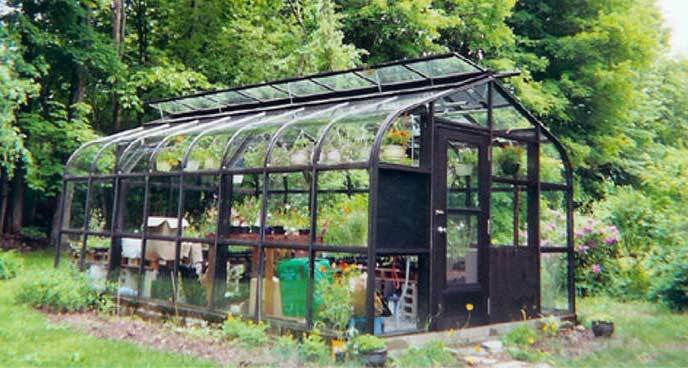 Warranty - All Grand Hideaway™ greenhouses come with manufacturer's warranty that all products will be new and free from defects in material of workmanship for five years. This warranty is in lieu of all other warranties expressed or implied. Standard Lengths:10' 6-1/4",13' 0-3/4",15' 7-1/4",18' 1-3/4",20' 8-1/4",23' 2-3/4",25' 9-1/4", 28' 3-3/4",30' 10-1/4",33' 4-3/4",35' 11-3/4",38' 5-3/4",41' 0-1/4",43' 6-3/4", 46' 1-1/4",48' 7-3/4",51' 2-1/2"
Custom Options: Custom lengths, Custom widths, custom knee wall heights, Custom height Centered door, Double doors, Custom colors, Soffit fill.